Warfare History Network » The Costly Kyushu Invasion of Operation Olympic? HomeDailyWWIIThe Costly Kyushu Invasion of Operation Olympic? Recently declassified documents reveal the preparedness of Japanese forces to meet an American invasion of Kyushu during Operation Olympic. During the more than half a century since the end of World War II, there has been much speculation about what would have happened if President Harry Truman had not dropped the atomic bomb on Hiroshima and Nagasaki and the invasion of Japan had actually taken place. Until recently, one document had not been available to researchers, the one that tells not what the Japanese military leaders intended to do, but what actually had been done, what was available to defend against the “Kyushu Campaign,” an Allied invasion of the Home Island of Kyushu, and what the actual defenses were. Immediately after U.S. troops occupied Japan, U.S. intelligence officers began interrogations of Japanese officials. 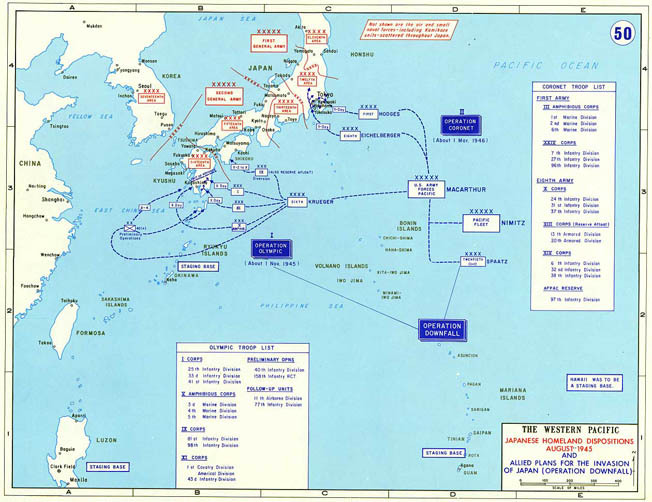 The U.S. Sixth Army G-2 section, including the Marine V Amphibious Force, interrogated the officers of the Japanese Second General Army, the organization responsible for the defense of Kyushu, and its subordinate units, which Sixth Army forces would have fought had the invasion taken place. The report of those interrogations was published on December 31, 1945, but was immediately classified Top Secret and hidden from public view. It remained so for more than a half century. Since 2006 the document has been publicly available through the U.S. Army Combined Arms Research Library at Ft. Leavenworth, Kansas. The information contained in that document provides a much more accurate assessment of what the U.S. Sixth Army would have faced if it had invaded southern Kyushu as planned. After U.S. troops invaded the Philippines, the Japanese Imperial High Command debated the Allies’ future actions. Various possibilities were considered—landings on the coast of China, an invasion of Formosa, a landing in Korea, and landings on one of the Japanese Home Islands. Some Japanese officers correctly deduced that the initial landings would most likely be on the southern portion of the island of Kyushu to establish airbases preparatory to a larger movement against Tokyo itself through the Kanto Plain, a deduction that became more likely when U.S. troops invaded the Ryukyu Islands in April 1945. The Ketsu-Go plan was drawn up to meet that eventuality. The plan for the defense of the homeland against invasion was developed in early 1945 and approved by the Imperial High Command in March. It was designed to defeat an Allied invasion fleet as far from Japan as possible, and if any troops actually reached Japanese shores, they were to be annihilated on the beaches. Ketsu-Go called for thousands of special attack aircraft (kamikaze) to be hurled at an invading fleet while it was still at sea, and instructions were given to convert the nation’s remaining aircraft for “crash-landing” operations. The Imperial Navy would sortie and engage the enemy fleet at sea. Should the approaching enemy continue, it would be attacked by thousands of smaller suicide ships and submarines as it approached Kyushu and by small boats laden with explosives after it anchored offshore. The combination of suicide air attack and naval action would concentrate on the troop transports and was expected to extract a horrible toll before the invading troops even reached shore and, if everything went as planned, would cause the enemy fleet to withdraw. Although the Imperial High Command realized that Japan could not win the war, it hoped that by defeating an invasion fleet, Japan would be able to secure a negotiated peace that would avoid the unconditional surrender demands put forth by U.S. President Franklin D. Roosevelt following the Casablanca Conference. But Japan’s military situation changed considerably after the plan was drawn up, and by the time the country surrendered without the first U.S. soldier setting foot on the soil of the Home Islands, the goals of the plan had become quite ambitious, as the Second General Army interrogations would reveal. It was generally believed that Japan kept its best troops at home to defend the homeland, but such a belief flies in the face of the psychology of the militarists responsible for taking the country to war. Until mid-1944 when U.S. forces captured Saipan, Japan’s military leaders and the troops they led were convinced that they were invincible and that their forces would defeat Japan’s enemies thousands of miles away from the homeland. Consequently, only four divisions of the Imperial Japanese Army—roughly 70,000 troops—remained in the Home Islands when Japan launched its offensive into Southeast Asia in December 1941. 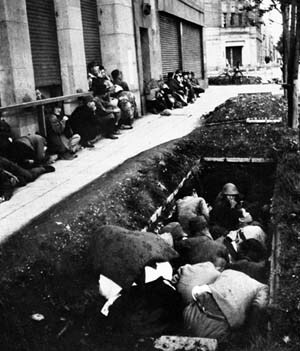 That number rose to only 11 divisions —approximately 165,000 men—by mid-1944. Although U.S. troops landing on Saipan in June 1944 caused the Japanese to consider the possibility of an invasion of the Home Islands, real preparations for home defense did not begin until early 1945, when it became apparent that the Home Islands were threatened. By mid-1945, the Imperial Japanese Army had built up a homeland military force of an estimated 1.5 to 1.9 million men organized into 53 divisions and support units, but nearly all of those divisions had been organized within the preceding six months and were made up of recent recruits and reservists, many of whom were no older than 16 or as old as 60. The bulk of the Imperial Japanese Army remained overseas in China, Manchuria, and Southeast Asia. Hundreds of thousands were in the Philippines, New Guinea, and on Pacific islands where they had been isolated and cut off from resupply, reinforcement, and evacuation to the homeland. Of the 14 divisions on Kyushu when the war ended, seven had been organized since May, and their personnel had minimal military training. Not only was their training inadequate, Japan’s arsenals lacked the arms to equip new units. Less than a quarter of the light machine guns needed were available and only half of the necessary rifles. Bayonets were in short supply, and mortars were used in place of artillery. With the country’s factories being bombed into rubble and its cities turned to ashes by constant Boeing B-29 Superfortress firebombing raids, there was little likelihood an adequate supply would ever be produced. It was also believed that Japan’s best troops were brought home to defend against invasion. Except for a few divisions that transferred from Formosa and Manchuria (two former Manchurian divisions were on Kyushu), Japan’s deployed military forces remained overseas throughout the war. Although there were an estimated five million men in the Japanese military at the end of the war, less than half were in the Home Islands and the only ones overseas that still had lines of communication with the homeland were those in China, Manchuria, Indochina, and Korea. Even those lines were threatened by Allied air and sea power. The Japanese Army remained intact—the only one of Japan’s armed services that did—but by mid-1945 it was hardly an army of battle-tested elite troops. Few soldiers in Japan had ever seen battle and since the country was never invaded, never would. Even the troops returning from Formosa and Manchuria lacked combat experience. Formosa was a Japanese possession and the only combat in Manchuria since the 1930s had been against communist partisans, who were more interested in revolution than in defeating Japan. When General Douglas MacArthur’s staff began planning Operation Downfall, a two-pronged invasion of Japan, in the spring of 1945 there were three Japanese divisions and one independent brigade on Kyushu, a total of some 62,000 men. In May, after the surrender of Germany and the Battle of Okinawa, the Japanese high command began reinforcing the large island in anticipation of an invasion. Two divisions were brought out of Manchuria while another came down from Hokkaido, Japan’s northernmost island, and the 40th Army headquarters transferred up from Formosa to take charge of the defense of the western sector of southern Kyushu. The bulk of the reinforcement consisted of establishing and activating new units using troops already on the island in other capacities supplemented by new recruits and recalled reservists. By the end of the war, Japanese strength on and near Kyushu had increased to 14 divisions, including four in northern Kyushu, plus seven infantry and three tank brigades. An antiaircraft division and two fortification units along with assorted headquarters and a communications brigade completed the forces on Kyushu and nearby islands. Most of these units were activated after May 1945. At the time of the surrender, there were 78,283 men in northern Kyushu who would have been held in reserve and 276,550 in southern Kyushu who were to meet the invading forces—a total of 354,833 men. No further reinforcement before the invasion was expected. Kyushu is a large island nearly 200 miles long with a width ranging from 80 to 120 miles of mostly mountainous terrain. Operation Downfall called for U.S. troops to occupy and secure only a 3,000-square-mile area on the southern end, a mostly rural region separated from the rest of the island by a mountain range spanning the entire width. Sixth Army intelligence reported a total of 735,000 Japanese military personnel from all services on Kyushu and nearby islands (25,000) at the time of the surrender, including some from units that were passing through Kyushu ports in transit to other destinations. The rest were army base and support troops, along with naval and air force personnel and recently mobilized civilian volunteer units. Japan’s third largest naval base was at Sasebo, but the Japanese navy had all but ceased to exist because of heavy losses and lack of fuel, leaving thousands of shipless sailors to serve in various roles on the island, including manning guns that had been removed from battleships for use as coastal artillery. The numbers of total military personnel were also swelled by the presence of numerous recent naval recruits. While the naval personnel could have been used to fill in the ranks of combat units, most had received little training in ground combat and would have been a stopgap measure rather than an effective fighting force. Plans were made for naval personnel to take over duties from army personnel such as coast watching and manning of fortified positions protecting Kyushu’s harbors, but they had not been implemented by the time of the surrender. Air force personnel consisted of pilots and maintenance and support people for the approximately 800 aircraft that were on the island. A large percentage of the total were base and support troops, along with members of the recently established Peoples Volunteer Fighting Corps who were being used in support roles directing traffic, communications, supply, and transportation, but would have been organized into combat units as the prospect of invasion became more imminent. Although the Sixth Army report gives no estimate, presurrender intelligence reported roughly 140,000 “civilian volunteers” in southern Kyushu and over 400,000 in the north. Their most important role was as human pack mules delivering supplies to combat units because Allied air attack had rendered motorized transportation on the island useless and the Japanese were depending on porters and pack animals as the primary means of transportation. Animals were used to transport supplies to distribution points from which they were delivered to the field by human porters. Japanese officers revealed that the much-touted Home Defense Forces that were supposed to greet the invaders with pitchforks, awls, and wooden pikes had yet to be formed and did not exist on Kyushu.As with the army, Japan’s air forces, both army and naval, were committed overseas at the beginning of the war. Unlike the army, which was built up in the homeland with new recruits, Japan’s air forces were severely depleted as the war continued. While they achieved a reputation of invincibility early in the war, by the end of 1942 they had lost control of the skies and over the next two years became so reduced that when U.S. B-29s commenced operations over Japan from the Marianas in November 1944, the American airmen found themselves opposed by only 375 Japanese fighters. It was not until the commencement of the firebombing raids the following spring that Japan began increasing its home fighter defenses, and even then the increase was minimal. Remarkably, Japanese aircraft manufacturers produced over 28,000 aircraft in 1944 alone, but few remained in Japan, which until November was mostly out of range of Allied bombers. Large numbers were lost in training and ferrying accidents before they even reached the combat zones, and thousands were grounded for lack of fuel and parts. When Okinawa fell into Allied hands, the Imperial High Command realized it was just a matter of time before the enemy would be landing in the Home Islands. To combat the threat, they intended to defeat the invading fleet while it was still at sea. Massive use of special attack air units was expected to destroy dozens of troop transports before they reached the vicinity of the landing beaches. An effort was made to convert as many aircraft as possible for special attack or crash-landing use, a conversion that consisted primarily of mounting a bomb. Because of the lack of combat planes, the army and navy turned to the trainers, transports, and other support aircraft that remained in the inventory to increase numbers and guarantee success. New weapons designed for special attack use such as human-guided bombs and rocket- and jet-powered flying bombs were put into development, although they were not produced in large numbers. It was commonly believed that Japan had thousands—perhaps as many as 10,000—special attack aircraft available to use against an Allied invasion fleet. Such a number was put forth by some Japanese interrogated after the war and was included in monographs published in 1946. It was believed that kamikaze attacks would have started while the invasion fleet was somewhere between Okinawa and Kyushu and would have continued through the landings and against the troops after they were ashore. The Second General Army officers told a different story. In answer to the question of how many combat-type aircraft they expected to have available and how they were to be used, they replied that they had 800 bombers and that most would be used in the special attack or crash-landing role against the transports while the invading force was still at sea. They also stated that a reserve of some 70 percent—560 aircraft—would be held on Kanto and in Korea for use against later landings. In short, the Japanese officers revealed that there were fewer than 1,400 airplanes, not 10,000, available for use against an invasion of the Home Islands. The Japanese indicated that although some aircraft would initially be used as conventional bombers, as the attacks continued they would also be ordered to the crash-landing role. They stated that there were no plans to use kamikazes against troops during and after the landings and that no air support was planned for the ground troops as the supply of aircraft would be exhausted in attacks on the fleet. The officers also responded that there were no jet- powered missile launching sites on Kyushu at the time of the surrender. Ten possible launch sites in northern Kyushu had been surveyed, but construction was never begun. They further revealed that rocket-powered aerial bombs were still in the experimental stage and were not yet in the inventory. Tags Allies, Asia, China, General Douglas MacArthur, Germany, Japan, kamikaze, Manchu, Mortar, Okinawa, Philippines, Royal Air Force, Saipan, US Army.